In scope ofthe relevant arrangement programs for implementation of integrated management strategy of the RA state border security it is envisaged to implement the modernization of border inspectioncrossing points of “Bagratashen”, “Bavra” and “Gogavan”. In accordance with the relevant RA decree at the Bagratashen border supervision crossing point area the implementation of component of European Bank for Reconstruction and Development (EBRD)for new bridge construction has been assigned to the “North-South Road Corridor Investment Program” PIU, SNCO under the RA Ministry of Transport and Communictaion. (b) Selection of the design company and construction of new bridge atBagratashen crossing point area. Armenian-Georgian intergovernmental joint commitee was created to coordinate the construction works of new bridge over river DebetatSadakhlo-Bagratashen border crossing point of thestate border of Georga and the Republic of Armenia.The individual staff of two Parties of the Committee was confirmed by the RA and Georgian Governments, accordingly by the RA Prime Minister Decree N 978-A as of October 21, 2015 and by the Georgian Government Decree N 1721 as of August 11, 2015. In order to coordinate the construction works of the new bridge number of discussions have been organized with the Georgian side, both directly- in bridge section and via video calls, as well. The Parties discussed the issues relating environment, archaeology, geology, social impact, bridge construction and technical supervision, infrastructure transportation, approaching roadsconstruction, border crossing, customs, tax, procurement process, legal, contract management and etc. On October 26, 2015 the first meeting of Armenian-Georgian mutual intergovernmental mutual committee took place at the Ministry of Regional Development and Infrastructure of Georgia, thus the organizational process of construction works of the new bridge called “Barekamutyun” over Debet river has officially been launched. Co-chairs of the Joint Committee Arthur Araqelyan the First Deputy Minister of the Ministry of Transport and Communications and Ilya Darchiashvili the First Deputy Minister of Ministry of Regional Development and Infrastructure, Georgia stressed the importance of the bridge being constructed over Debet river at the area of Sadakhlo-Bagratashen border crossing point of Armenia and Georgia, stating that the new bridge will facilitate the service quality of cargo and passenger transportation, provide time saving, safe and comfortable movement in board Crossing Points. The bridge will contribute the service quality increase of passenger and cargo transportation and time saving, will facilitate the trade with Georgia, Russia and Europe. 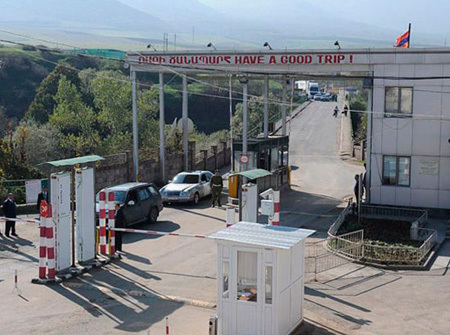 Through facilitation project of border crossing point it is envisaged to establish modern infrastructures of state border crossing points, to make the movement of transport means and products comfortable between Armenia and Georgia and, afterwards, for people leaving for European Union and Eurasian Economic countries, develop the capacities of entities responsible for border management.